This sizzling steak fajita recipe will have you coming back for more. Simple yet tasty. Fajitas are traditionally made with skirt steak and said to have found it’s beginnings back in the 1930’s. Skirt steak was given to the Mexican cowboys as part of their pay during cattle round ups in South and western Texas. The Mexican cowboys or vaqueros would cook this beef up over a campfire or grill and eat it wrapped in warm tortillas. Today in many restaurants or at home you will find sizzling fajitas served with grilled onions and bell peppers. Many condiments such as guacamole, salsa, shredded cheese, tomatoes and sour cream can be added for your fajita enjoyment. Our beef fajita marinade recipe includes beer and lime juice to aid in tenderizing the skirt steak which tends to be a little tougher cut of beef. By using an acidic liquid in the marinade, the beef comes out nice and tender if marinated at least 8 hours but over night is best. You can use other cuts such as flank or sirloin steak if you wish. Let me show you how to make fajitas. Take a plastic ziploc type bag and add the first 12 ingredients and mix them well. Then add the steak. Don’t slice the meat yet, large pieces are easier to grill. Place this bag in the refrigerator overnight. Before we begin cooking the steak fajita recipe, let’s talk about getting this dish on the table so that everything is ready at the same time. This can be a bit of a challenge so I am going to have you think about all that needs to be done. Then I will tell you the order in which you need to do it. If you can get a helper that would be great. We have to grill the meat and then slice it before we put it on the table. We have to cook the bell peppers and onions on the stove. We have to warm the tortillas just before serving so they are piping hot when served. Condiments need to be prepared and placed on the table. Let’s start with the condiments. Prepare the guacamole, grate the cheese, and make the salsa an hour or two before we serve the fajitas. Place them in serving bowls and keep chilled. Next, slice the onion and bell peppers. Place them in a bowl and add 1 Tbs. of olive oil, toss to coat and set aside. Now let’s get the tortillas ready for the oven. If you are using flour, wrap 8 in foil. When you are ready to heat these, place them in a 275 degree F oven for 5 to 10 minutes. An alternative to this is to heat flour tortillas one at a time on a cast iron pan. The last time I made this steak fajita recipe I used corn tortillas. I sprinkled a little water on each tortilla and placed them on a plate on top of a piece of waxed paper. I placed another piece of wax paper on top and microwaved them on high for 30 to 40 seconds. Microwaves vary, so experiment. Now remember, you are not going to heat your tortillas until the last minute because you want your guests to have hot tortillas to put their fajitas in. You know what I always say “It’s gotta be hot to be good”. If you have one of those tortilla keepers this is a good time to use it. I want to mention that I came across the best tortilla warmer ever. I picked it up at a Home Show and will never use anything else. You take your flour tortillas, up to 12 of them and put them into this little pouch and microwave them for about 45 seconds. The tortillas stay warm for an hour! These work great for a buffet party as there are always hot tortillas ready to go. I can’t recommend this product enough. Now we have every thing in place and we are ready to make this sizzling steak fajita recipe. Fire up the BBQ and ask someone to grill up the steak if you can get a volunteer. Otherwise, heat the grill on medium high. Take a clean, white, dry, wash cloth and pour some olive oil on it. Using tongs to hold the cloth, rub the cleaned grates to coat so the steak doesn’t stick. Place the steak on the grill. You can close the lid or leave it open. I like to leave it open so I can keep a close eye on the meat. You don’t want to over cook this and it only takes 2 to 3 minutes to grill per side for medium rare. Once it’s done, place the steak on a clean plate and let it rest for 5 to 8 minutes to let the juices redistribute before slicing it. Watch my video on how to make steak fajitas and you will see how I sliced it up so it would be nice and tender. Place a cutting board and knife next to your sink so that it’s ready when the steak is done. Have an appropriate dish or bowl nearby to place the sliced steak in. You don’t want to be searching the kitchen looking for the right dish while your steak gets cold. We like to heat our dishes slightly so they don’t chill the food. You can do this by adding 1/2 cup of water to the bowl and heating it in the microwave for 1 minute. Pour out the water and dry the bowl before adding your food. Let’s move on to the bell peppers and onion. Start this when the steak goes on the grill. Use a cast iron pan (fajita pan) if you have one. They really work the best for making fajitas. You’ll love the flavor and they keep the food warm longer too. Add a tsp. or two of olive oil to the pan and heat on high. When the pan is hot add the bell pepper and onion. Add a sprinkle of sea salt. Cook till veggies are translucent. Stir occasionally but let them brown a bit so they will have that nice brown grilled look to them. Keep them warm right in the pan. When the steak comes off the grill, place all the condiments on the table. If heating tortillas in the oven, put them in now. Slice the steak into thin strips across the grain and place in warmed dish or bowl. If you are heating corn tortillas in the microwave, now is a good time to do that. Place in a tortilla keeper or covered with a warm towel. (another good use of the microwave). Bring out the bell peppers and onions and you are ready to have a fiesta. 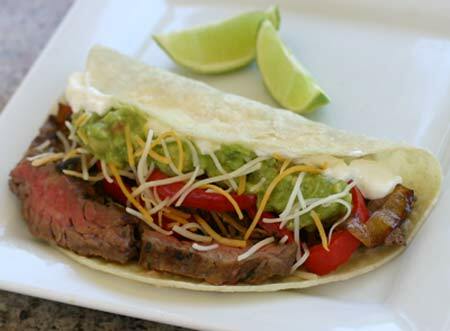 This steak fajita recipe makes a great meal. Since everyone builds their own fajitas they can make them just how they like them. If case you’ve never had them before here is how you do it. Take a hot tortilla and add some steak, onions and bell peppers. Sprinkle some cheese and add a spoon of guacamole and sour cream and top with salsa. Delicious. You might be thinking of serving some refreshments to accompany this steak fajita recipe so I thought I might suggest you try our margarita recipe for the adults and a tropical smoothie for the kids.